Windows 10 had made sharing files with other people faster and easier for its users on desktop PC, laptop or tablets. Here we are going to show you how to share files using Public folder on Windows 10 on the same device or with others over the network in just a few simple steps. Although public folder had been a constant Windows feature even before Windows 10, but on the latest Microsoft operating system it facilitates quick file sharing with other users. The rationale behind Public Folder is it makes it easier for users to share files with other people who use the same PC or with other devices connected via a same network. With Windows 10 Public Folder you no longer need third-party apps, programs or external USB/DVD to share content with others. On Windows OS, you can share folder or folders manually from your Windows account, but with Public folder you can configure Windows settings in a way that makes it possible to share files automatically. There’s no need to set prior share and security permissions in Public folder, moreover, you can allows others to access folder’s content without them needing to login with a username or password. You can find the Public folder in Windows 10 in C:\Users\Public just like the previous Windows versions. All accounts linked to a particular Windows 10 PC can access this Public folder. You can configure network settings in a way that set limits on the Public Folder access level to only those with an account sharing the same password on your PC. Windows 10 Public Folder contains a number of subfolders such as ‘Public Downloads’, ‘Public Videos’, ‘Public Documents’, ‘Public Pictures’, and ‘Public Music’, to enable you to keep files in these folder in an organized manner for easy access. In the tutorial below, we are going to walk you through the steps of sharing files with others via Public Folder and how to disable Public Folder as and when needed. Public Folder is not among the more visible features that’s why most Windows users are mostly either unaware or unfamiliar with it. Since the Public folder in Windows 10 doesn’t have its own dedicated Settings page, only way to access it is by manually open the folder and adjust its settings from within the Public folder according to personal user preferences to enable file sharing via the folder. You can pin the Public folder to the Quick Access, taskbar or the create a desktop shortcut for easily accessing the feature in Windows 10. After that, those who you allow to access Public folder will be able to use files in it. 1 – Open File Explorer. 2 – Go to C:\Users\Public. 3 – Right-click on Quick access. 4 – Select Pin current folder to Quick access. 2 – Go to C:\Users. 3 – Drag and drop the Public folder to the taskbar. 3 – Right-click or drag and drop to the desktop and from the context menu select Create shortcut here. 2 – Click Network on the left-pane of the Explorer window. 3 – Now double-click on the PC name containing the content. 4 – Next, double-click Users and open Public folder. 5 – When inside the Public Folder, add a desktop or taskbar shortcut, or add the location to the Quick access. Also, keep in mind that users with access to the Public folder can modify, read and delete files, therefore, confirm before sharing anything on the Public folder. By default, Public folder is enabled on Windows 10 for local users, and it cannot be turned off because its created by Windows using system settings on every edition of Windows 10. But you need to manually enable Public Folder if you wish to make Public folder files available to other users sharing the same network. 1 – Open Control Panel. 2 – Click on Network and Internet. 3 – Click on Network and Share Center. 4 – Click on Change advanced share settings on the left window pane. 5 – Click All Networks to expand it. 6 – Here, enable the Turn on sharing so anyone with network access can read and write files in the Public folders option. 7 – For allowing users sharing the same network access to the Public folder content without password, check the Turn off password protected sharing option. 8 – Hit Save changes button to finish the task. Now see how to disable Public Folder Sharing on Windows 10 if you change your mind. 4 – Click on Change advanced share settings on the left pane of the window. 5 – Expand All Networks option. 6 – Select the Turn off Public folder sharing option and hit the Save button. Windows 10 Public Folder offers a great and convenient way of sharing content and files with other users on a single PC or those sharing the network. However, surprisingly, not many Windows users are aware of it. You can share music, videos, pictures, documents and similar other files with others without needing to follow complex settings. Public Folder sharing is the best option to share files and folders on Windows 10 PCs on small networks or home PC. This feature is not suitable for Windows 10 Enterprise and Pro users in business and organizational settings. 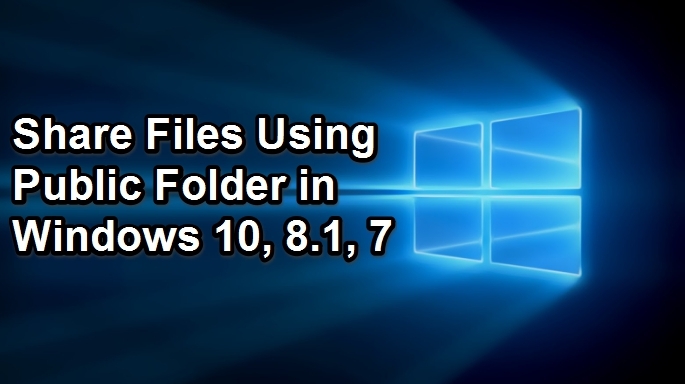 You can use the same steps above for sharing files from Public folder, enable and disable public folder on Windows 7, Windows 8, Windows 8.1 as well. For feedback, share in the comments below.